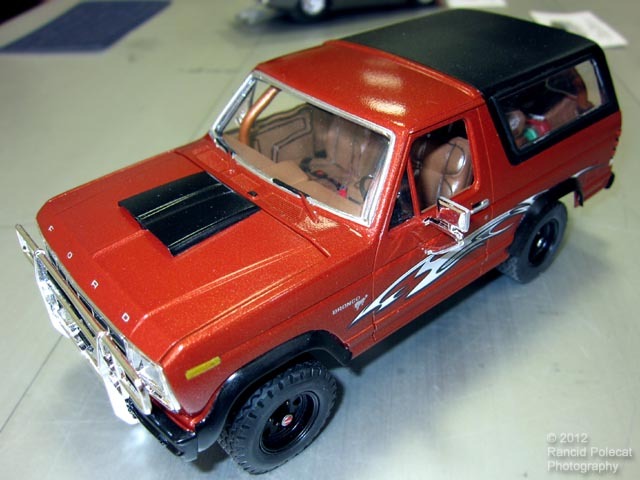 Covered in Testors One-Coat Burnt Orange paint and complemented by black bumpers and fender flares, Kevin's Bronco is built mostly out of the box with added detail. A hood scoop from his parts box and chrome tailgate trim from a later-model extended cab Ford pickup kit lend a "show and go" sensibility. In the driver's area, Kevin scratchbuilt seat belts from masking tape and plastic bits. The floors are covered in black flocking and the headliner is a Rebel Flag. Kevin used dark washes to highlight details in the truck's grille and the upholstery patterns. He wrapped the spare tire cover in electrical tape to provide a fabric texture and painted the front hubs to resemble Warn brand manual locking units. He also scratchbuilt a fashionable large-diameter exhaust tip for venting spent gasses in a prominent way.